Again, myself and Gareth were lucky enough to be invited to another chalkstream to target some of the largest UK grayling we’ve ever seen! Steve Carew from Fulling Mill was gracious enough to invite us to their stretch of the river Itchen to target some of the large fish which inhabit within. This was the second time I’ve fished the Itchen, the last time it was a complete washout as we were a long way down the river system. High and coloured water killed the whole day, but on this trip, the water was in perfect conditions other than the leaves (which only appeared late on). As we arrived we were greeted with a maize of water ways, carries here there and everywhere but what looked to be the main river was packed full of very large fish indeed. 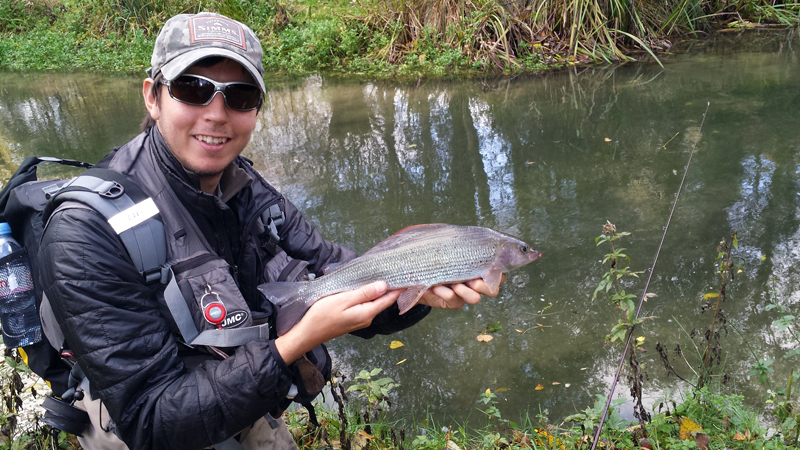 We saw 4/5 fish lined up, some rising and the rest grazing the river bed, all were between 1 1/2 and 2lb! Steve said to let these alone as there were bigger fish below… We hastily followed as you’d expect. Gareth peered over the tall reeds from a wooden platform strategically placed next to a bridge. There was a large grayling sitting just shy of the reeds and G’ managed to plop his bug right in front and got a response immediately. As he struck the rod doubled over and nodded just once before the hook pulled out, a fish certainly over 2lbs made it’s way back to its lie and sulked the rest of the morning. With various other fish around Gareth made his way upstream, taking many fish towards the back of an Island. The light was low with little to no sunshine which made spotting fish mid-river fairly tough, I managed to cross the river to get a better view, the treeline bank give a great light and almost every fish in the river was visible. The lack of shrubbery was a challenge so keeping low and stealthy was key. I managed to pick off some of the best grayling I have seen this winter on a small hares are and pink bug, the one from a previous post. The fish i caught were immaculate and were of a very decent average size. The below was a good fish sighted mid-river, a guesstimate would be 2lb 2oz. On that same island I landed a much large fish, which would have pushed two and a half pounds, but unfortunately water on the lens give a bad shot! The rest of the day was a blur, many fish caught and lost, with the odd brownie putting in an experience. I particularly liked this stretch as it’s not full of annoying out of season brown or rainbow trout, you get to focus on catching grayling without a large trout taking the pickings first. We saw some of the largest grayling we’ve ever seen in UK rivers on this day, to say they were like buses would be an understatement! You know the type, fish which have been around a couple of years and know absolutely every trick in the book. I spent hours chasing these large ones, some which would have come close to 4lbs in weight. At the end of the day as the light started to fade, the fishing become somewhat tough, so we set ourselves a challenge to get 5 fish each before leaving for the two hour journey home. There we’re plenty of small fish between 3/6 inches to be had, but we wanted a few over a pound to finish the day. By now you could imaging we’ve fished the water to death, the better fish were spooky and a lot of them had been already caught.. Line shy, fly shy, how do you get them? Fishing the Anton a few weeks ago I worked out that dropping the fly onto the fish, ‘fly first’, from above the fish proved effective late on, by casting at a visible fish from yards above, and holding the line tight against the current so the fly sinks and rises with differed tensions, the grayling were suckers and I got my 5 fair quickly. Once you got the drift right the fly patterns hardly mattered, hot headed bugs with white or orange beads, the tungsten beads from Funky Fly Tying made great sighter flies – Simply ‘Watch the lights go out‘ as the fish takes the fly. cracking grayling mate. Well done! Cheers J’! I love the chalkstreams, you can’t beat them for sight fishing. Although they are expensive, when our rivers or lakes aren’t fishing so well it’s worth a punt! Ive only just started fly fishing, had a few goes on the river bollin near manchester. Failed miserably. Im from Ringwood though so i might save up for a blank on the avon lol. 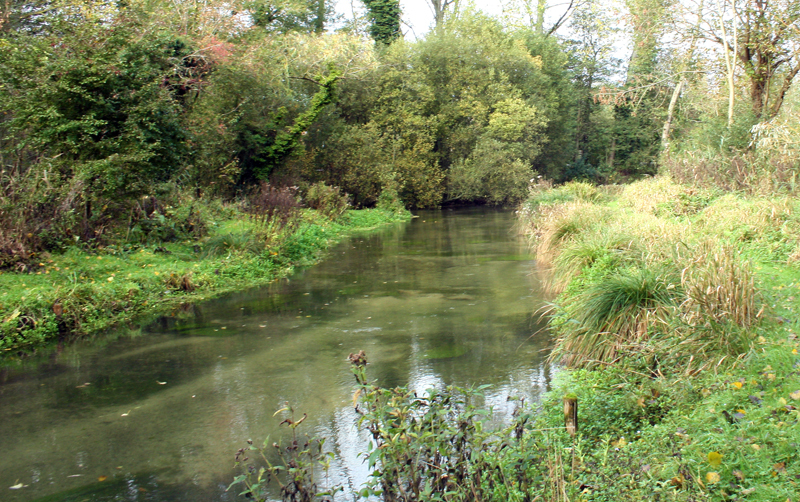 If im gonna blank it may as well be on one of the finest chalkstreams in the country. Next Next post: Having trouble stripping peacock herl?